Villa Leanda is set in a wonderful, elevated postion with magnificent views over the sea and surrounding hillside. The large upstairs balcony is a perfect spot to admire the magnificent sea views. 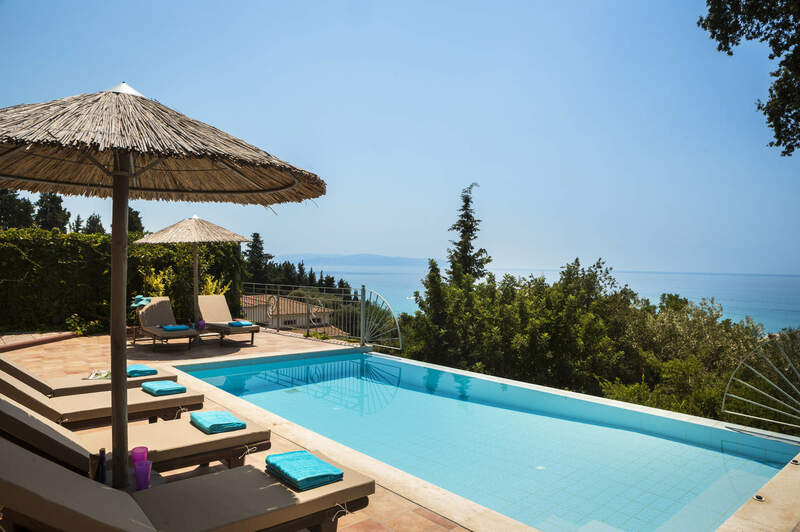 The villa is also conveniently situated within easy walking distance of Lourdas beach and the resort centre with its shops, restaurants and tavernas. This 3 bedroom villa benefits from a heated private pool, air conditioned/heated bedrooms and WiFi all at no extra cost. A charming villa with stunning sea views, just a short walk from the centre of Lourdas and the sandy beach. The private infinity pool offers the perfect splace to relax and enjoy the stunning sea views. To one side of the villa is a large, shaded pergola with comfortable seating and a dining table and chairs. Why not cook up a delicious meal on the brick BBQ and enjoy dinner with a view? The villa has a private, gated, driveway that leads to the front door with parking for your hire car. The open plan lounge and dining area is comfortably furnished with a dining table and chairs, 2 sofas, a decorative fireplace and television. The kitchen has a rustic style with wooden cabinets and is fully equipped for your holiday meals. Double doors open from the lounge onto the large shady balcony which affords delightful views over the pool and down to the sea. From here 7 steps lead down to the pool terrace and barbecue area below. On the ground floor there is a twin bedroom with fitted wardrobes and patio doors opening onto the front of the villa. There is also a separate shower room next to the twin bedroom. On the first floor there is 1 double bedroom and 1 twin bedroom. Both bedrooms are furnished with warm colours and share a separate bathroom. They also have amazing hillside and sea views which can be fully admired from the large shared balcony. From here you can also watch the sunrise whilst enjoying a cup of early morning tea, or the sunsets with a sundowner! This villa is registered and licenced by EOT Greek licensing association. This number is: 0830K10000845401. Villa Leanda is set in a wonderful elevated position with magnificent views across the sea and surrounding hillside. It is on a quiet residential road, yet within walking distance downhill to the pretty resort of Lourdas with its beach, restaurants and bars. Its sister, Villa Andrea is located next door, makng it an ideal choice for families. The villa is within easy walking distance of a mini market, perfect for purchasing day to day essentials and souvenirs to take back home. Walk through Lourdas and browse the local shops, ideal for topping up on your holiday amenities. Lourdas has many tavernas and a few bars spread throughout the village and by the beachfront, just 10 minutes' walk from your villa. Lourdas is situated behind one of the longest beaches on the south coast of Kefalonia. Here you can hire sunbeds and umbrellas, as well as small boats and jet skis in the summer months. Kefalonia's leisure activities are mainly water based. You can arrange kayak hire near Lourdas Beach, or why not venture along the coast to Skala which has a larger selection of water sports on offer? The island is full of history and culture - there is certainly no shortage of things to see and do. In this area are the Castle of St George, Mazarakata Tombs and the monasteries of Sission and St. Andreas. Villa Leanda is not available to book for season as it is sold out. Take a look here at the Kefalonia villas that are currently on sale. The castle (Kastro) of Assos, the focal point of Assos's peninsula, was built by the Venetians in the late 16th century in order to protect the city from pirate raids. Today, one can still admire part of the walls and the arched entrance gate. In the Castle, one can see the ruins of the Venetian High Commissioner's house, the barracks and the church of Agios Markos. From here, the view of the sea and the lovely bay of Myrtos is so unique it attracts many tourists. Continue as you are. Gorgeous villa. Lots of space for family of five. Pool table and table tennis table very useful for teenage boys. View beautiful. Rep excellent.